Judy McGrath’s photo of a tree that fell on Hardscrabble Road near Douglas Road; the area was without power for many days. For some, winter is a time to embrace the cold and all the activities it brings. 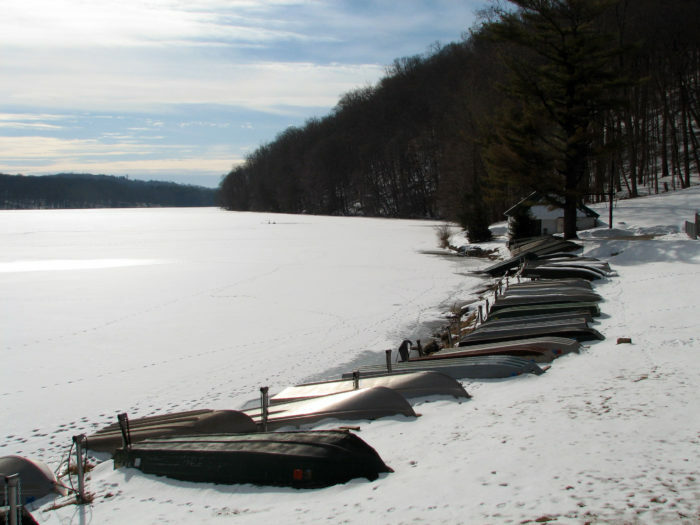 Skiing, skating, and sitting by a crackling fire are big draws for those that are more “snowbird” than “sun worshiper.” Though seasonal tufts of snow can be fun, many residents recall winters that were a significant challenge (Superstorm Sandy is still quite fresh in everyone’s memory). 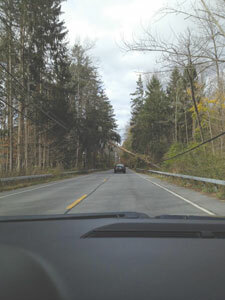 During the first real storm of the season, on Sunday, November 2nd of this year, fallen trees left several homes without power for much of the day. Communication was steady as Supervisor Rob Greenstein updated residents via Facebook on the current status of ConEd service calls and road closures. Though the storm was unusual due to the sudden but predicted high winds, it was a sobering reminder of seasons past. Several residents were kind enough to share their winter woes, and ways to prevent a repeat of past misfortunes. Joyce Wong will never forget the blizzard of 2011. As a matter of fact, people often ask her if she is expecting visitors during the winter before making their own plans, because there is usually a travesty with the weather for Wong and her guests. “I saw the power line snap,” recalled Wong, describing the tree limb that fell on the ConEd line to her home from the street. It was the year that 10 inches of snow fell very quickly, and the resulting loss of power prevented her from pumping water from her flooded basement. Six days without power left Wong cooking meals on an outdoor grill. Her husband was able to purchase one of two remaining portable generators from a hardware store, which enabled the use of either a toaster or a television. Visitors from Washington, D.C. had to stay with the Wongs while Amtrak and Metro North remained out of service. The Wong family front yard was blanketed with Sandy’s October snow. “People had lived here for years and never lost power,” said Wong. Hurricane Irene was very challenging for Judy McGrath. No power for three days kept her sump pump from operating, leaving a flood in her basement. Coupled with Sandy, which left her home with no power for four days, the storms were the reason the McGrath’s purchased a whole-house generator for their home. One of McGrath’s neighbors had a generator during Irene, and was kind enough to allow other families to hook into it. “Three basements were kept pumped by one generator,” said McGrath. When she decided to install one, between the paperwork, variances, and fees, the process took much longer than expected, and was quite onerous. 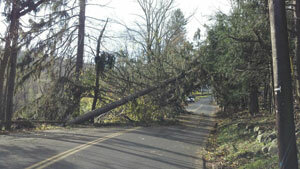 Sandy caused problems for many, but some experienced much longer outages than others due to blocked roads. Shiyang Paskowitz had no electricity for two weeks in 2012, and her family was stranded in their home for the first few days with no ability to even phone or text. Neighbors worked together to cut downed trees into movable pieces and clear the road for accessibility. After that, the Paskowitz family was able to drive to Washington D.C. to stay with family. Erin Ringham had just moved from one house in New Castle to another when Sandy struck. Unfortunately, her new home did not yet have a generator. The home she had sold was the only one in the neighborhood with power, however, and she heard from friends that the new owners were providing neighbors with hot cocoa and coffee during the outage. It wasn’t long before Ringham’s new home was equipped with a generator. What do all of these women recommend others do to prepare for winter? In addition to a generator, McGrath suggests roof heating cables, which are low-current electrical cables that can be turned on during a snowstorm to prevent ice from forming. This would allow homeowners to avoid frozen gutters and the dreaded ice damming many experienced with the snow of 2014. Wong urges people to fill gas cans at the first mention of a major storm, using an additive such as “Sta-Bil” to keep the gas in good condition for longer storage. Paskowitz recommends having insulation installed in the attic, as well as a tall ladder to allow for immediate removal of snow and ice from the roof. 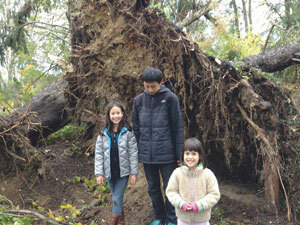 Joyce and Stanley Wong captured this striking image of Sandy’s large tree destruction. What is New Castle doing to prepare for winter? 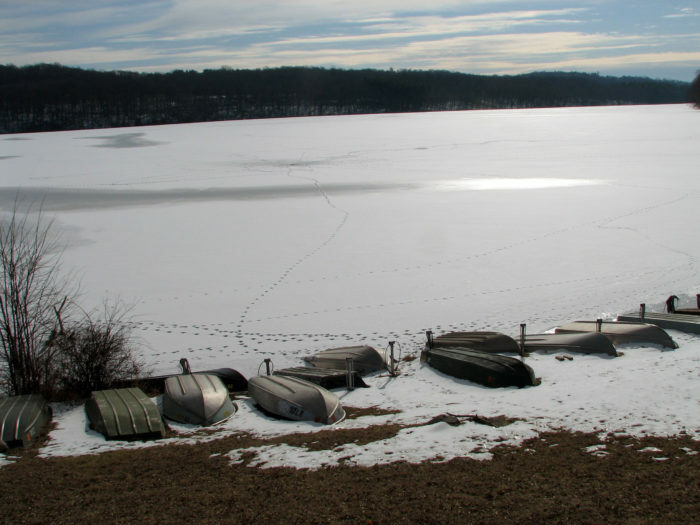 According to Greenstein, the town is in good shape as far as salt supplies, with enough on hand to handle up to four storm events with more on the way. The town has added to the DPW plowing staff for a primary crew of 17 with five more as back-up, all having received the Cornell University operations and safety training. Two new salt spreaders are being added to the fleet, as well as rented sidewalk-clearing Bobcat. Most importantly, the town has established an Emergency Preparedness Committee. Per Greenstein, “There are many emergencies that can impact New Castle. The most common are severe weather, power outages and flooding. Although these emergencies cannot be eliminated, we can reduce the risk of injuries, property damage and economic impact through individual and community preparedness.” The purpose of the committee is to assist in planning and preparation for emergency operations. “Be Prepared,” the famous Boy Scout motto, has its merit. Preparing ahead of a storm or blizzard benefits everyone. For instance, gathering necessary supplies before conditions get hazardous keeps people off the roads. Powering up phones and devices before a potential outage provides access to town and police updates. Keeping trees trimmed and monitored make falling limbs less likely to take down power lines or gutters. Eileen Gallagher, her husband, two sons, and two dogs have been happily living in Chappaqua for over 11 years. Previously an accountant and elementary school teacher, she is now a freelance writer and enthusiastic volunteer both in town and beyond. Standing next to the exposed roots of an uprooted tree, the Paskowitz children (Anna, Lyle and Kate) show, by comparison, the size of the loss of many mature trees, this one on Marcourt Drive. 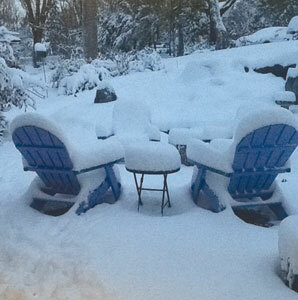 “Snow day!” To some, those words bring joyful shouts while, to others, groans of dread. 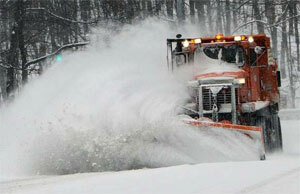 Students, teachers and snowplow companies are in the first category. Weary parents, store owners, and those expected to report to work regardless of the weather are among those in the second. Regardless of how we feel about it, winter is upon us. I spoke with some local people who help ensure that folks can get out and about and also picked up a few Inside tips on ways to enjoy Armonk this winter season. Keeping the town open for business is a priority and involves more than merely clearing all the roads and side streets. Over seven miles of state-owned but town-maintained sidewalks are in need of snow removal. New snow blowers have been added to the arsenal of equipment so shop owners and offices can remain open and people can move about safely. 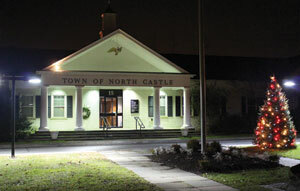 All is calm and bright in the Town of North Castle. Goldberg shared that there are some things residents do inadvertently which are counter-productive to snow removal and de-icing. “I don’t think most people know that putting snow on the roads is against the law. Even people that think they’re doing the right thing by pushing the snow across the street or off to the side are actually removing some of the sand and de-icing chemicals the trucks spread. They literally wipe away what the trucks just put down.” She also pointed out that the town is not liable for damages caused to vehicles when they are out working, so if it is possible, staying home and out of the way is the safest course of action even in an all-wheel-drive vehicle. Once roads are cleared, there are lots of activities available for children and adults alike. Superintendent of Parks and Recreation Matt Trainor shared that the kids’ gourmet cooking class and singing classes are among the more popular choices. Organizations like Mad Science or The Nature of Things offer programs that can spark the imaginations of young scientists. Other ongoing programs for first- though eighth- graders are karate and basketball. “What I like about our basketball program is that there’s no pressure. There are no tryouts or anything like that. Parents often call and ask and they like knowing that if their child wants to play basketball, he or she can just sign-up and play.” Trainor added further, “We offer art classes in oil or watercolor painting for both adults and children. There are a multitude of outside contractors that we work with.” Occasionally the Recreation Department pairs up with local restaurants to offer cooking classes, or will offer different types of dancing, such as ballroom or line-dancing, but the fitness classes fill up fastest. Adult fitness classes like yoga and pilates are the most popular and are ongoing options. One truck and driver from the intrepid snowplow force, out clearing roads during the early morning hours in Armonk last winter. 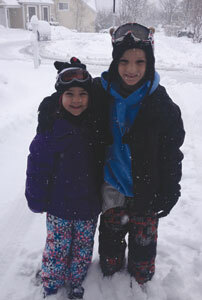 Theresa and Anthony Kosakowski, ages eight and 10 respectively, enjoying outdoor fun during a a snow day in Armonk. As temperatures plunge and snow starts to fall, you have plenty of options. Your child can take a cooking class and whip you up a gourmet meal and then you can work it off in a fitness class because roads will be cleared for you to get there. 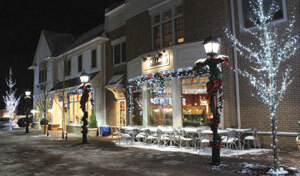 Whether you stay cozy indoors or you brave the elements for some outdoor fun or shopping locally, the town of Armonk is ready! Valentine’s Day, 2014: Snow Art! Following a Houlihan Lawrence office contest inviting staff to submit their favorite snow scene or snowman picture, “Snowy Peter,” a skiing snowman built by the Kimtis family won (submitted to IC by mom, Karen). Getting plastered with mounds and mounds of thigh high fine soft snow on Valentine’s Day might have caused municipal and school headaches galore (including using up the allotted number of school closings), but it just brought out the snow artist in others. 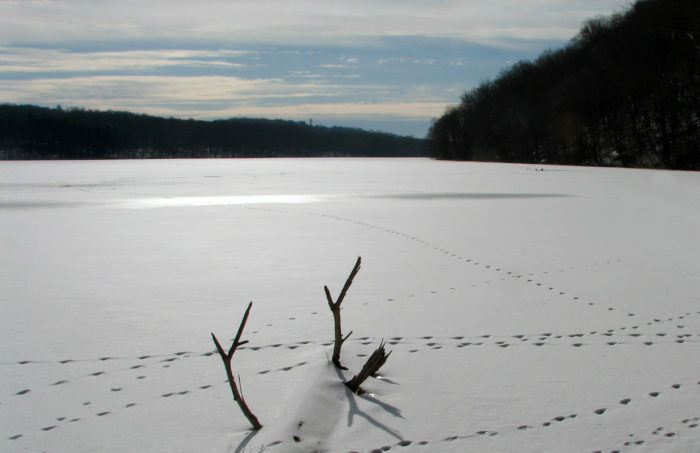 A call on Facebook for snow art submissions brought many works to our attention! Here’s a sampling. Snow Igloo: By the Hessert boys of Chappaqua. In fact, I would consider myself a holiday enthusiast. In August, when everyone is lounging by the pool and enjoying the great outdoors, I’m longing for that white blanket of snow to cover Chappaqua and bring the holiday festivities with it. Bring on the lights, Secret Santa, Menorahs, and fuzzy sweaters. When Macy’s starts announcing their holiday specials in October and you simply can’t imagine anyone thinking about holiday shopping before Thanksgiving, think again. Yet, it’s not the “40% Off Everything” sale that I adore about the holiday season, although I certainly don’t mind it. It’s the essence of the holidays, the joy infused air and inexplicable sense of genuinely wanting to make others happy, and expecting nothing in return. After all, Santa Claus wasn’t created with the expectation after Christmas, a gift wrapped box donning a bow with a card that addressed “To Santa” would appear under the Christmas tree. This reindeer owning, red-suit sporting character exists to preserve the anonymity of a gift-giver. After all, isn’t that why we give gifts? The holiday season is, under no uncertain times, about bringing happiness to others. Although the holiday experience varies for every person and every faith, this sentiment is shared by many. Furthermore, the holiday season brings family together. During the course of two months, families separated by thousands of miles, or even bodies of water, reunite to celebrate. “To me, the holidays are mainly a time to get together with family. It’s great to see people you almost never get to see,” said Owen Ruggiero, a freshman at Greeley. And if you’re like me, the term “family” extends to just about everybody you or your family has ever met. The weekend before Chanukah begins, my house becomes somewhat of a hotel, housing most of my family. Come the infamous Chanukah party, my extended family, with seemingly all of Chappaqua–nay, all of the tri-state area–congregates in my house to celebrate the impending week of festivities. There is enough food in my house to feed a medium sized army. Despite the issue of navigating my house without injuring someone (the Chanukah Party is an indisputable fire hazard), I love it. Nothing can rival the wonderfulness of being surrounded by people who love one another, and it’s only the holiday season that can bring about such a feeling. Additionally, holidays serve as a time for rest–a break from hectic schedules, tests and work, and a reminder of what is truly important in our lives. “The holidays ensure a break from normalcy,” explains Alex Kaufman, a junior at Greeley. Liora Fishman is a junior at Horace Greeley High School and was a member of the Greeley dream team who produced last September’s issue of Inside Chappaqua Magazine.